Roll up to Boom! Coffee at midnight and you might find a line of cars on each side of the hut at West International Airport Road and Arctic Boulevard. Big sellers are the energy drinks and sweeter items — Red Bull smoothies, Red Bull drinks with an added shot of 5-Hour Energy, blended Oreo frappes — sold alongside the standard lattes and Americanos. And it’s all available any time, night or day. Billing itself as the only 24-hour coffee hut in Anchorage, Boom! opened in 2016. 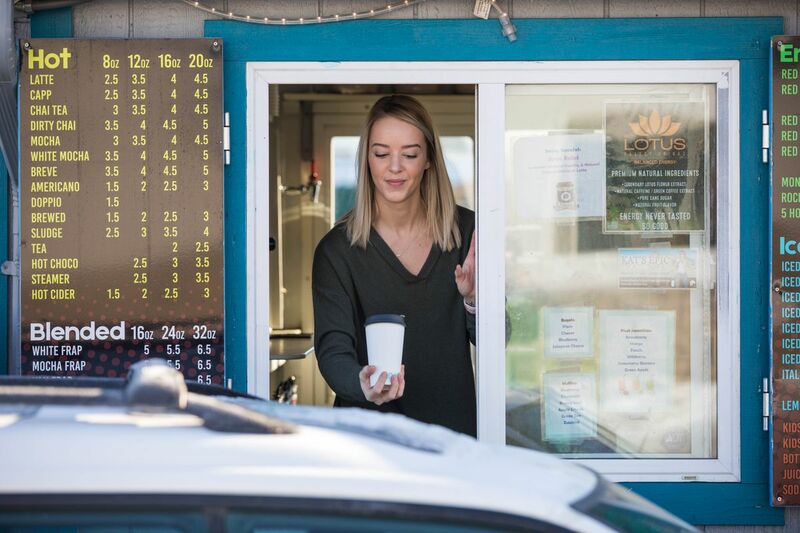 Inside the shop on Tuesday morning, two baristas shuffled back and forth, grinding espresso and serving whipped cream-topped drinks out the drive-through windows. 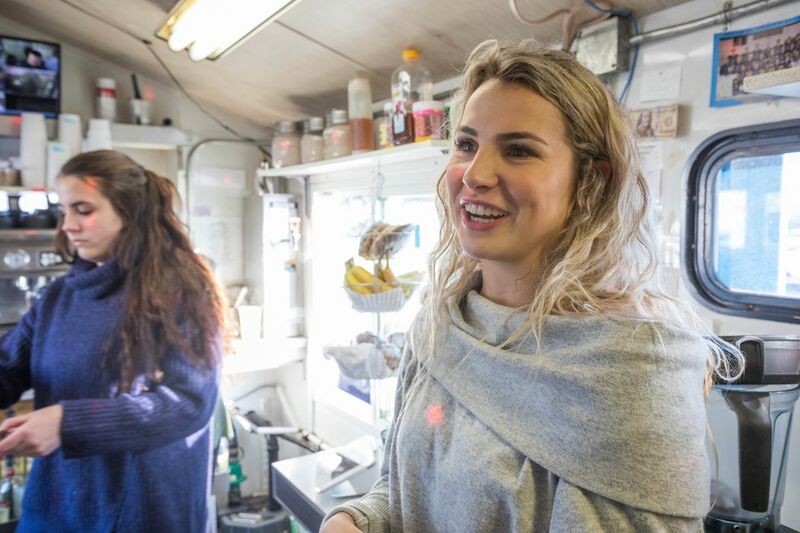 The stand is set to expand this spring into a double-decker operation at the same intersection, said 21-year-old Lauren Hines, one of the owners. A blue two-story hut — with the upper level for more storage — is stationed across the parking lot, where it’s under construction to replace the current one. The nighttime is the “No. 1 time” for the shop, Hines said. “Our booming time.” It helps that there are other nearby 24-hour spots, like a car wash and a Tesoro gas station. Hines, who is also a student at the University of Alaska Anchorage, talked to ADN about the business. So tell me about being the only 24-hour coffee hut in town. Challenges? Stuff you’ve learned? Once most coffee shops close, like 6 o’clock, 8 o’clock, we just get a huge rush. ... Everybody loves it, everybody’s night owls here, we have twice as many employees, so we have 14 employees. We all are so close-knit. ... There’s always like three people in here and it makes it so much easier and less stressful, especially when you have 10, 12 cars in line. Everybody gets our 32-ounce blended drinks. And it definitely takes a few minutes to make, but it’s worth the wait. Why did you guys want to do (the new double-decker hut), to have more space? We’ll have a dumbwaiter to pull stuff down. We’re going to have a disco ball. ... My biggest thing was just space. With (building) code, especially in Anchorage, it’s so hard to meet the expectations. ... So, I was like, build up, rather than wider. We’re meeting code and everything, so just build up. What other trends do you notice people are into? I would say 32-ounce (drinks), mainly. Our Red Bull smoothies, our frappes, all that we make are blended drinks. It’s what, 10 degrees out right now? And that’s all that we’re making today, is blended drinks. What’s the craziest you’ve ever seen it, in terms of cars in line? After the earthquake, actually. So, we stayed open during the earthquake. We had just a little bit of damage. We’re like, we’re staying open. ... Emilee was working, and Emilee calls me, she goes, “There’s 20 cars in the parking lot.” But we’re gonna stay open, we can do it, we can handle it. ... Hit record sales. It was awesome. Everybody came together. This shop has only been open since 2016, and the state recession has been happening that whole time. I’m always curious if businesses notice an impact from that. I think coffee is something that people will always buy. It’s like somebody’s cigarettes, sometimes. ... I don’t think there’s a notice, particularly, with the recession. So you don’t study business -- was that hard to learn at first (when you were 19)? We do sell a lot of coffee, but I wouldn’t just say a normal Americano or a normal latte. It’s built into something bigger all the time. It’s built into a big frappe. Red Bulls are our biggest-selling energy drink. Yes. I think I have five night guys .... My biggest thing, too, is safety at night, and that’s why the guys are super popular. When I moved to Anchorage I was like, I’ve never seen a coffee stand where there’s a guy working until I came here (to this hut), I don’t think. It’s always young women. Honestly we got a lot of s--- for it, too, at the beginning. Now they love it. They were like, “A guy doesn’t know how to make coffee.” ... They love them now. We call them the bro-istas. Who was giving you s---? They work during the day sometimes too. ... But especially the night because safety is my biggest thing and it’s, as long as we have a guy working. Or we had girls working at night, if they would carry a gun (in the past). In the new hut, we’re going to have alarms, a pocket alarm that each individual will carry when they’re working. ... If they have an alarm on their pocket, they have something that keeps them safe. We have so many cameras. Safety, for being 24 hours, is definitely the main priority. This interview was edited and condensed for clarity and brevity.